On Friday, March 8, 2013, West Michigan Center for Peacebuilding will host the opening reception for "Ancestral Art" Indigenous Voices, An Artist Benefit for Haitian Peasant Groups. Opening reception: March 8 6 p.m.
with Josh Villaire on the 1s & 2s. Tuesday - Wednesday: 3:00 - 9:00 p.m.
Thursday - Saturday: 1:00 - 9:00 p.m.
Sunday: 1:00 - 6:00 p.m. The month-long showing held at the Ice Cream Gallery and Toys (117 S. Division, Grand Rapids, MI) brings the public into contact with artists Jose Noe Castro, Picardo, Ted Jauw, Joel Howell and Ian Swanson. In collaboration with Holland Friends of Art, and the Caribbean Coalition for the Arts & Culture West Michigan, a series of artist events will be occurring throughout the entire month. Roundtables and discussions will help the community actively engage with elements of the Haitian culture, particularly with a focus on the Vodoun spiritual perspective. Documentaries, as well as vinyl record parties, will investigate in-depth the Haitian people and their spiritual experience. Insight into the culture will be explored in the building of community altars, as well as presentations of the Creole table. Immersion in traditions of Haitian singing, drumming and dance will welcome newcomers and demonstrate the cultivation of strong communal bonds. “Within each individual moment all events are spoken within dedication to the Lwa, Erzulie Dantor; who in Vodoun cosmology represents both the spiritual protection of women, children, single mothers and lesbians, and is associated with the Black Creole Pig of Haiti and the Haitian Revolution. Most Haitian women serve Erzulie Dantor, and many men serve Dantor as well, especially those enlightened men who honor, love and respect women,” says Ian Swanson, Executive Director of the West Michigan Center for Peacebuilding. 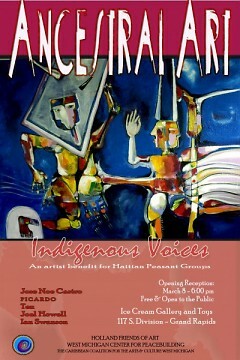 The opening reception begins on March 8th, 2013 at 6 p.m., and is located at Ice Cream Gallery and Toys, 117 S. Division. The show will include live music performances by Black Cat Bone, Invisible Mansion and Cangue League Orchestra, with Josh Villaire on the 1s & 2s.